Plans to provide a bridge across Sydney Harbour waxed and waned from well before the turn of the 20th century. The earliest recorded drawing for a bridge was made in 1857 by Engineer Peter Henderson and several designs were put forward before 1898. In January 1900 the government called for competitive designs and tenders for a bridge and by September of that year 30 designs had been received. The designs were exhibited in the Queen Victoria Markets (now the Queen Victoria Building) in Sydney. John Bradfield, Chief Engineer of NSW Public Works, started planning for a bridge as early as 1912. But it was 1921 before the first round of tenders for the construction of a bridge were called. Legislation for the bridge was initially passed in 1922 by the Sir George Fuller Nationalist government, but in a surprising turnabout tenders were re-called in 1923, and closed in January 1924. By the closing date of 16 January 1924 more than 20 designs for the bridge had been submitted. They came from six countries, with a variety of designs and a large range of projected costs. The firm of Dorman, Long & Co. Ltd. lodged three separate designs for an arch bridge, two designs for a cantilever bridge, and two designs for a cantilever arch bridge. JJC Bradfield and his team completed an assessment of all the tenders in just four weeks, and the result of this work was published in the document Sydney Harbour Bridge: Report on Tenders. The document outlined the various engineering and economic criteria used for judging the tenders. The result was to be a bridge ‘the best that engineering skill can devise’. The assessment of each tender for the bridge, based on the set criteria, is presented in this now rare publication, which for a large engineering structure, is written in surprisingly straightforward terms that make it easy reading for the layperson. It presents the criteria on which the bridge tenders were judged, and the assessment of the tenders based on that criteria. It also shows the people of Australia the different types of bridge we could have had if the decision process had taken other directions. It also gives us the opportunity to apply the criteria to determine whether we would have agreed with the decision to erect the Dorman, Long & Co. Ltd. bridge design A2! It also provides an insight into the process of decision-making by government in the early part of the 20th century. Tender E.–Plan No. 5, submitted in conjunction with Mr. C. A. P.
Stage 4. Plan No. 18, Photograph No. 18. Kent, Government Printer, 1924, p16. In the 20 or 30 years before the design for the present bridge was accepted, there were many other interesting ideas. Some of them won prizes in bridge design competitions. The following images feature some of the designs that were submitted. The bridge design awarded second prize in the 1900 Harbour Bridge competition, as reported in the Town and Country Journal, 8 December 1900. A design for a bridge across Sydney Harbour by Norman Selfe, from the Tender of Stewart & Co., Sydney, 1902. A proposal by Mr Norman Selfe to connect Sydney with the North Shore, from the Sydney Mail, 8 December 1900. It is clear that notwithstanding that a design may be practicable and suitable, the question of economy of cost stands in the front rank, because, however beautiful it may be, it cannot be recommended if the cost is prohibitive. On the other hand, cheapness is not everything; a design may be so unsightly that however low its cost, the public would not accept its erection in such a prominent position as the proposed bridge would occupy. Source: Sydney Harbour Bridge Advisory Board, Report on designs and tenders, 1903, pp 3, 6 in C. Mackaness (ed) Bridging Sydney, HHT, 2006, pp 91, 93. In the years before World War I, Bradfield himself submitted several proposals for a bridge across the harbour. In 1912 he proposed a suspension bridge. And in 1913, just one year before the outbreak of WWI, the parliamentary committee responsible for recommending a bridge design finally chose Bradfield’s design for a cantilever bridge, similar to the earlier cantilever design featured in Image 2. If it had not been for the outbreak of WWI in 1914, it is more than likely that this design would have been given the go-ahead. However, after the war when the bridge building plans were renewed, the cantilever design was eventually abandoned in favour of an arch bridge. There is an interesting story associated with the choice of an arch bridge. The original wording of the Act of Parliament of 1922 which gave the final go-ahead for the building of a bridge provided only for a cantilever bridge. John Bradfield, who was overseas at the time investigating bridge designs, became interested in exploring the possibility of an arch design. He cabled an urgent message to the Parliamentary Committee asking that three words be added to the contract. So the original Act which would have provided ‘for the construction of a cantilever bridge’ was amended to read ‘provided for the construction of a cantilever or an arch bridge’. The rest, as they say, is history! When tenders were called for, the English civil engineering firm Dorman Long Co. Ltd. offered several designs based on both the cantilever and the arch. Their design of an arch bridge was the eventual winner. Source 2 – And the winner is ...! The recommended tender was a two-hinged steel arch with abutment towers faced with granite that was one of seven potential schemes submitted by Dorman Long for three different types of bridges. Importantly, the tender was 'in accordance with the specifications and the official design'. In Bradfield’s justification of the winning selection, it is clear that he favoured the design for its appearance, ‘dignity’ in use of granite, and engineering qualities. Significantly, Dorman Long was the only tenderer to provide for the whole of the fabrication to be carried out in Australia. Which of the four early designs (Figs 1–4) might you have chosen for the Sydney Harbour Bridge – if a choice had to be made? Why? Can you pick which of the arch designs submitted by Dorman Long is our Sydney Harbour Bridge? How can you tell? According to Source 1, what important requirements did a bridge design have to meet to make the short list in a bridge design competition? What features of the winning design submitted by Dorman Long weighed most heavily with the judges? (Source 2). What word did Bradfield choose to sum up his approval of the design? Can you suggest other words that would be appropriate? (based on your own opinion). Use the images provided in this unit (or find others) to briefly explain the differences between the following kinds of bridges: cantilever, suspension, arch. Here is a useful site! 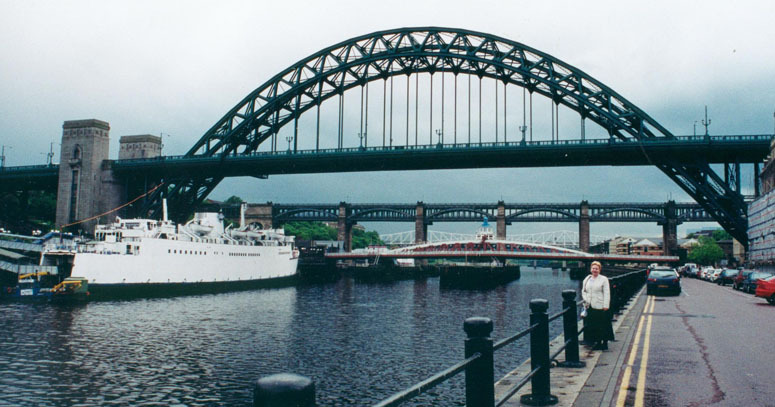 Two other bridges are almost identical to our Harbour Bridge: one is the Tyne Bridge at Newcastle in England and the other is the Hell Gate Bridge in New York. Use the sources provided in this unit to write the letter that might have been written by JCC Bradfield to Dorman Long Co. Ltd. informing them of their successful tender for the Sydney Harbour Bridge. your hopes for the success of the project/expectations of its impact on Sydney (to make your letter as authentic as possible you should find out the names, titles, etc of both the writer and the person/s to whom the letter is being sent). Write the front-page story (about 250 – 300 words) that would have appeared in a Sydney daily newspaper, eg The Sydney Morning Herald, announcing Dorman Long’s successful tender. Your story should include an appropriate image. Record a one-to two-minute news report that would have been broadcast on a Sydney radio station announcing the successful tender. Include an advertisement that might have been used at the time. Play your recording to the class. You can also convert PDF documents into alternative formats.